The transfer of Ca2+ from the cytosol into the lumen of mitochondria is a crucial process that impacts cell signaling in multiple ways. Cytosolic Ca2+ ([Ca2+]cyto) can be excellently quantified with the ratiometric Ca2+ probe fura-2, while genetically encoded Förster resonance energy transfer (FRET)-based fluorescent Ca2+ sensors, the cameleons, are efficiently used to specifically measure Ca2+ within organelles. However, because of a significant overlap of the fura-2 emission with the spectra of the cyan and yellow fluorescent protein of most of the existing cameleons, the measurement of fura-2 and cameleons within one given cell is a complex task. In this study, we introduce a novel approach to simultaneously assess [Ca2+]cyto and mitochondrial Ca2+ ([Ca2+]mito) signals at the single cell level. 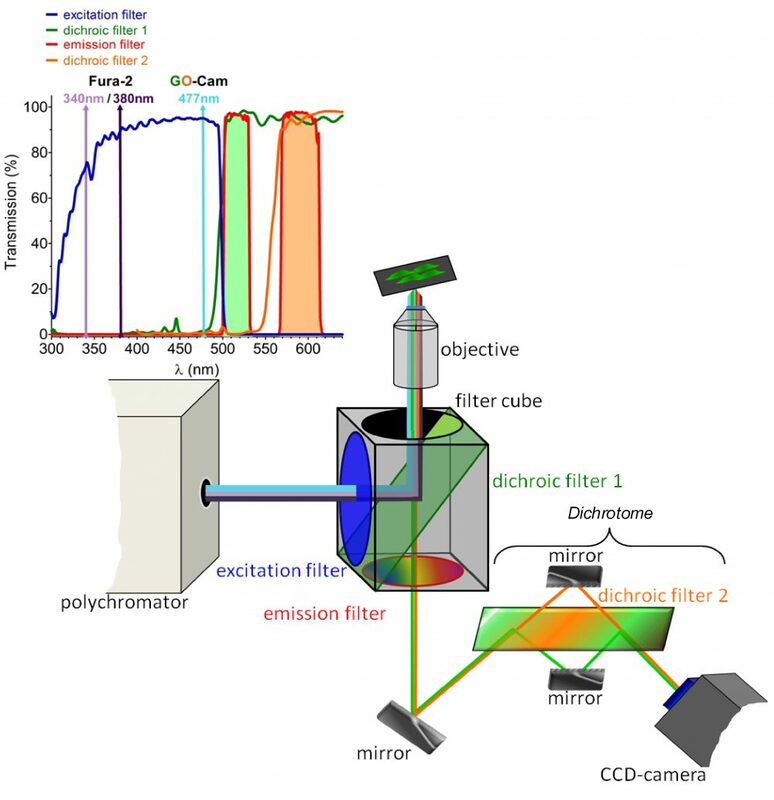 In order to eliminate the spectral overlap we developed a novel red-shifted cameleon, D1GO-Cam, in which the green and orange fluorescent proteins were used as the FRET pair. This ratiometric Ca2+ probe could be successfully targeted to mitochondria and was suitable to be used simultaneously with fura-2 to correlate [Ca2+]cyto and [Ca2+]mitowithin same individual cells. Our data indicate that depending on the kinetics of [Ca2+]cyto rises there is a significant lag between onset of [Ca2+]cyto and [Ca2+]mito signals, pointing to a certain threshold of [Ca2+]cyto necessary to activate mitochondrial Ca2+ uptake. The temporal correlation between [Ca2+]mitoand [Ca2+]cyto as well as the efficiency of the transfer of Ca2+ from the cytosol into mitochondria varies between different cell types. Moreover, slow mitochondrial Ca2+ extrusion and a desensitization of mitochondrial Ca2+ uptake cause a clear difference in patterns of mitochondrial and cytosolic Ca2+oscillations of pancreatic beta-cells in response to D-glucose.